* 1976, lives and works in London, UK. gesamte Belegschaft der Greyfriars Bus Station und Trevor Pitt. Survivalist was a response to the continued threat of demolition to Greyfriars Bus Station in Northampton. My intention was to make it appear that the building was somehow attempting to brace itself and possibly even save a part of itself from the demolition. To achieve this I built a structure that appeared to have grown out of the side of a disused unit in the area beneath the station concourse. 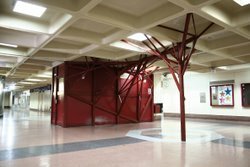 The structure was built from materials found in and around the station and painted to match the unit. Special thanks to Naomi Haigh, Hilary Stone, Alan at Mansells, Jewsons, Alan Craggs, Shawn and all the staff at Greyfriars Bus Station, and Trevor Pitt.